Welcome to Cakes by KASA. A cake is a symbolic touch that adds meaning to each and every special occasion. Cakes by KASA are passionate by all things cake. We offer a broad range of styles, from classic or contemporary wedding cake, to individual cup cakes or a novelty celebration cake. We work with you to create the perfect cake, either by designing something new or with your ideas, we can adapt a design to suit your own colour scheme or requirements to make your ideas turn into reality. We pride ourselves on our attention to detail on our edible works of art. 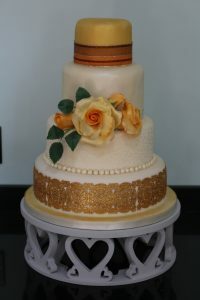 exquisite flavours, intricate lace-work, piping and delicate sugar flowers complete your perfect cake and vision. If you are interested in ordering one of our cakes, or require any further information, then please do get in touch with us via our contact page. Our prices vary based on final design and decoration required. Cakes by KASA can now provide you with Buffets for all occasions, small intimate private dinner parties for that special celebration. Please do take a look at the Buffet page. Error: Error validating access token: Session has expired on Saturday, 29-Sep-18 14:53:54 PDT. The current time is Wednesday, 24-Apr-19 09:18:51 PDT. © All pages are copyright Cakes By KASA 2018 Bakes and Cakes by Rara Theme. Powered by WordPress.